A lot goes into establishing a people’s mindset, how they saw the world and what it meant to them, but a fair place to begin is with the medieval model of the universe, discussed most accessibly in C.S. Lewis’s The Discarded Image. One of Lewis’s points is that while medieval man looked out onto the universe, and saw the same facts that modern man does, the meaning was different. The facts were the same, but they did not mean the same thing, and they did not mean the same thing because medieval man saw the world differently. The model itself is simple enough and well enough known and so requires little time. It is simply the view of the universe he inherited from the classical ancestors. 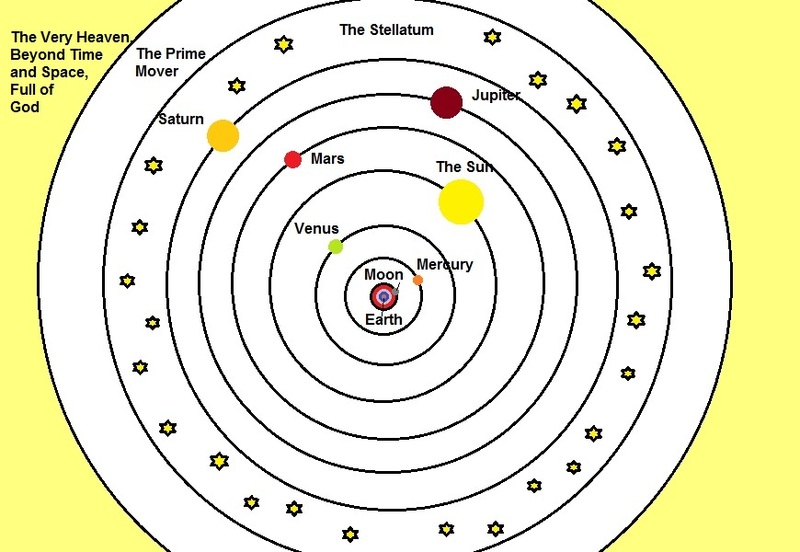 The Universe in the Medieval Model. Borrowed from the ancient Greeks. But while this is well-known, it is rather too little appreciated. Most are simply inclined to focus on the rather uninteresting fact that medieval man believed, as the ancient scientists told him, that the earth was at the center of the universe. More interesting is the medieval belief that the universe was enormous, but finite in size; modern man has recently come to believe the same thing. More interesting still, however, was the medieval belief that the universe was a place of order and organization. It was a place of order and organization because it was the product of a divine mind. When modern man looks out on the universe, he looks out on something huge, strange, unknown, and alien. Something with no order, rather, in some theories, he looks on a universe moving toward ever greater disorder. He looks out, in Lewis’s words, on a shore-less sea or a vast, dark forest. Yet, Medieval man did not see that universe. To him (again according to Lewis) the universe was more like a vast Cathedral. Huge and finite, but ordered, with an order written into it by its maker. Hence, the universe was not only a place of order, but a meaningful place. The universe had its meaning built in by its maker- just like a Cathedral would. Earth was built on the pattern of the heavens, and the heavens on the pattern of God. And so the universe represented the wisdom and goodness that made it. Not so today when modern man looks out on a meaningless universe forced either to soldier on in the midst of meaninglessness or to create a subjective meaning of his own. In the Middle Ages, there was no need to create meaning- it was already there. Finally, like a Cathedral, because the universe was the produce of a divine mind, built on the pattern of that mind, and earth built on the pattern of the heavens, matter also had meaning built into it. Matter could thus have a higher meaning. Modern man sees the same facts as medieval man, but they do not mean the same thing. For medieval man, matter could represent divinity. Hence the Cathedrals, marriage symbolism, and Francis of Assisi’s love of nature. In a sense, it was like a three dimensional world compared to flat land- a smaller universe, but a larger world.